"Powers' retelling of the history of natural gas production and policy provides a very useful context for understanding where we are in the progression of gas development, and his careful debunking of the oversold expectations for gas is timely and important." 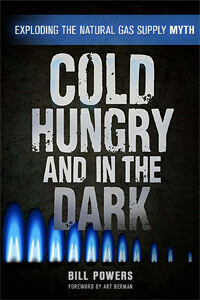 Cold Hungry and in the Dark started out as a research project in November 2009. The contrarian in me was skeptical about industry claims of low cost shale gas extraction and the purported size of the shale gas prize. Was there really an unending supply of cheap natural gas available from shale deposits? As I dug into the production histories of the Barnett and Fayetteville shales and later, the Haynesville and Marcellus shales, it became clear that hype exceeded reality. By any metric, shale gas is an important source of energy, however, as I detail in the book, its impact on America's future energy supplies has been vastly overstated. And I explore why. Additionally, and unbeknownst to many energy observers, America's non-shale natural gas production base, more that 60 percent of total U.S. production, has entered a terminal and irreversible decline. I review in detail how total U.S. production is poised to fall in 2013 and for several more years. Production growth from the Marcellus and elsewhere will not be enough to keep America's natural gas production base stable. Rising demand from the electrical power industry and elsewhere, at a time of falling domestic production, is a recipe for a 1970s-style gas crisis. Many claim new methods of drilling will unlock additional resources – they have done so in the past. Technological advances however will not be enough to offset the advanced maturity of much of America's production base. Add to that, dwindling imports from Canada and a tight world LNG market and you have a significant supply crisis in the making – one that will damage our already weak economy. Fortunately, for readers of Cold, Hungry and in the Dark, the reasons for the crisis and ways to dampen the blow are made clear. "The rhetoric around '100 years of gas' and growing production from shale with low prices for decades is pervasive, and is setting the US economy up for an energy shock that is completely off the political radar. Bill Powers brings a crystal clear focus to the realities of future gas production and prices, and dissects the pervasive hype. It is a must read for understanding the risks of accepting conventional wisdom of eternal cheap energy on long term US energy security. Gas will be a very important input to US energy for the foreseeable future, but assuming it will be cheap and abundant ad infinitum is unrealistic and dangerous in terms of energy policy development – this book provides the facts on future gas supply and prices that are critical in designing a more sustainable energy future."